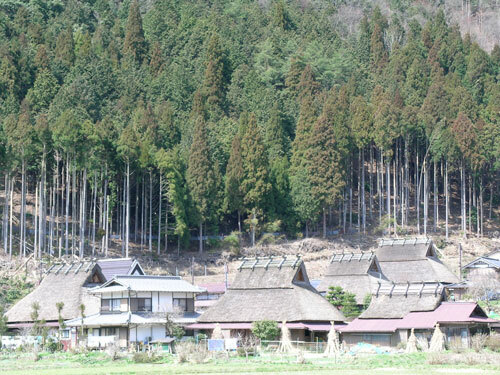 Nestled in the mountains north of Kyoto, there is a cedar-logging village called Kitayama. Kitayama cedar is famous throughout Japan as a treasured and elegant building material. Shown here against a backdrop of growing cedars are the traditional thatched roof cottages of forest workers’ families. Sadly there are fewer families who maintain the painstaking forestry management practices required to produce Kitayama cedar. There is however a local Cedar Museum that memorializes the dying craft of Kitayama Cedar production. Sections of the mountain side are successively cleared and replanted in a sustainable fashion. It is said that a forestry worker harvests the trees planted by his grandfather and that he in turn must plant trees for his grandson. As the trees grow, those destined to become the greatest logs are pruned of their branches so that the central trunk grows tall straight and sturdy. Trees destined to produce slender logs for lighter and more delicate constructions are pruned of their central trunk, as shown in the picture at right, so that the branches of a single tree can produce numerous small logs. These of course are just good forestry management practices for sustainable production, but the real magic of Kitayama begins with molding of the living trees prior to logging. 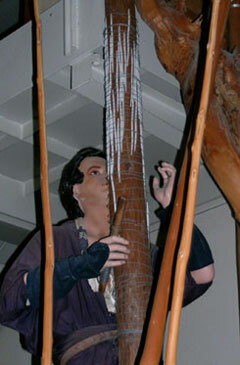 As shown by the manikin displayed at the Cedar Museum, a forestry worker climbs to the very top of the tree and then begins wrapping the tree with straw-like forms made of hard plastic tied tightly against the tree with wire. The wrapping continues for the entire length of the tree from tip to base. And when complete, the the tree is allowed to grow for two years before before it is harvested. 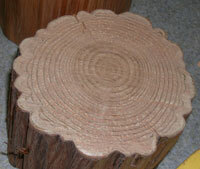 The cross section below shows the concentric rings of the tree’s initial growth and then the outer layer develops a rippled texture as it grows into the spaces between the plastic molds wedged tightly against it. It is this molding process that creates the elegant forms for which Kitayama cedar is so famous. Afterlogging, the fresh trunks are stripped of their bark and cured and then polished to a high sheen by rubbing with wet sand. This latter task was frequently performed by women, children and the elderly members of the family. 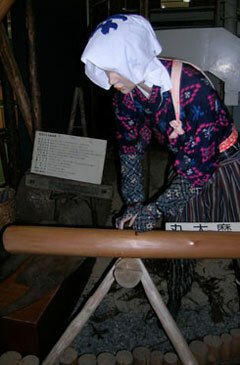 Another manikin display at the Cedar Museum shows a woman in the traditional costume of a forestry worker’s wife, polishing a cedar log using wet sand rubbed into the log with her bare hands. Although there was no indication on any of the signs, I did wonder how many hours of such polishing were required to transform the raw logs into the beautiful glowing wood that we saw on display throughout the museum. To produce varying effects, a number of different sizes and styles of molds could be applied. Several typical samples are shown in the picture below. The friends with whom I toured the museum included another textile artist who wondered aloud whether this molding process should be considered a form of “shibori for woodworkers”. The thought did make me laugh, but perhaps there is some validity to the comparison. 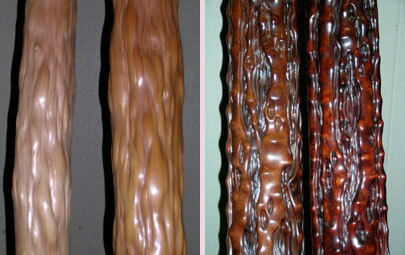 Of many sample logs on display, polished but unstained logs are shown on the left, while those that have been stained after polishing. Such beautiful wood would be used for decorative interior architectural details in a traditionally constructed aristocratic home. But as much as I loved learning something about Japanese woodwork, I am a textile maven at heart. So I was immediately drawn to the luscious pale colored silks I saw displayed toward the end of the exhibition. 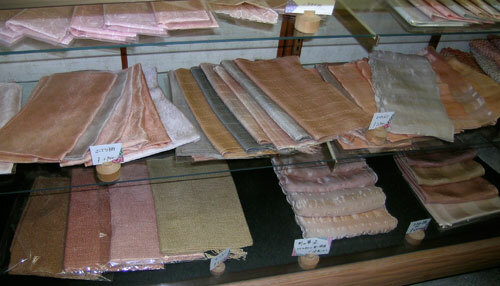 The amazing range of peach, coral, rust, and even blues and silvery greys were all achieved using different mordants with cedar-based natural dyes. Kitayama Village is a daytrip north of Kyoto, but visiting this area is well worth the effort. This entry was posted in Japanese fabrics, Kyoto living on October 25, 2009 by admin.